Buffalo, NY - Members, family and friends of the 11th Armored Cavalry's Veterans of Vietnam and Cambodia (11th ACVVC), with a thunderous roar, rolled into Buffalo for it's 15th annual reunion held at the beautiful Adam's Mark Hotel. My wife, Hellen and I were there for this four day event which began on August 3 and ended Sunday, August 6. Over 900 folks attended. K Troop was represented in force by what appeared to be about 80 troopers and guest. 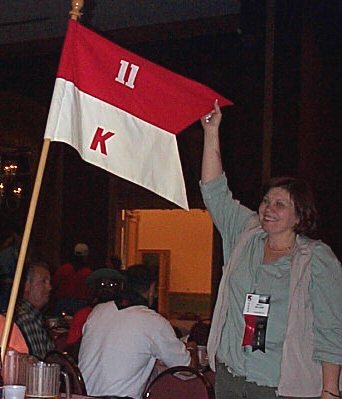 To the left, the K Troop standard is proudly displayed by a K Trooper's wife. Discover more about this exciting event by clicking on the links below. See the photos and read the articles about Buffalo Reunion 2000. Visit the 11th Armored Cavalry's Veterans of Vietnam and Cambodia at 11thcavnam.com.